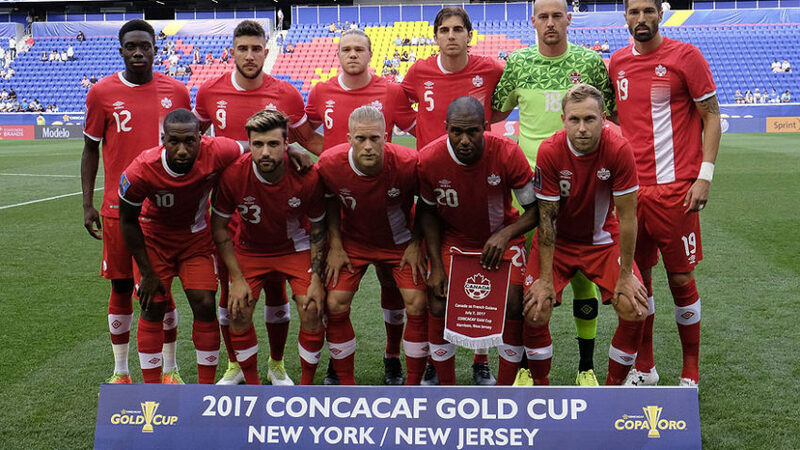 HARRISON, New Jersey, Sporting Alert — Canada and Costa Rica opened their CONCACAF Gold Cup 2017 campaign at Red Bull Arena on Friday night. In the opening game of the tournament Canada picked up a 4-2 victory over French Guiana, as teenager Alphonso Davies starred late. Dejan Jakovic and Scott Arfield netted in the 28th and 45th minutes to give the Canada a 2-0 lead at half time. A second half brace from Davies, who was scoring for the first time for the national team and is the youngest to do so at the Gold Cup in team history, then sealed the win after French Guiana had cut the deficit to 3-2 in the 70th minute. Following the opening goals from Jakovic and Arfield, 16-year-old Davies fired his team to a 3-0 advantage on the hour mark. The Canada team takes a photo at Gold Cup 2017 on July 7. However, quickies from Contout, who headed home an Anthony Soubervie corner kick in the 69th minute and Sloan Privat, who redirected home in the 70th, generated some nervous moments for the Canadians before Davies slotted home an assist from Anthony Jackson-Hamel to secure the three points with five minutes left. “I am filled with pride for the guys,” Canada head coach Octavio Zambrano said after the win. Canada will look to book a place in the knockout round when it returns to action on July 11 against Group A favorites Costa Rica. Meanwhile, French Guiana will seek to bounce back from the opening game defeat when it takes on Honduras in the second game. In the second game on the night, Costa Rica edged Honduras 1-0 at the same venue. Forward Marco Urena found the back of the net after 39 minutes when he converted a Rodney Wallace cross to break the deadlock. The win sees Costa Rica moving to three points and is second in the Group A standings behind Canada on goal-difference.